The character of the eastern border of the European Union (EU) has changed in consequence of EU expansion in recent years, when more than 10 countries, mainly from Central and Eastern Europe, have joined the Union. The frontier in its current shape extends from Finland in the North to Bulgaria in the South of Europe. It is extremely diverse in regard to topographic characteristics, climatic conditions, as well as probability of occurrence and intensity of ‘illegal activities’. The borders of new member states, shared with the former Soviet Union countries, are particularly exposed to ‘illicit trafficking’. This part of the eastern EU frontier is a buffer between the relative prosperity of the West and the poverty of the former Soviet Republics. The average salaries on its west side are five or six times higher than the ones on the east side. The border is known for being the Union’s backdoor, known as an area of which is difficult to control. Border security is one of the main priorities recognized by the European Security Research Advisory Board (ESRAB) and European Commission. FRONTEX, with its headquarters in the capital of Poland, is one of the agencies that were established in order to co-ordinate EU activities related with border protection. EUROSUR (European Surveillance System for Borders) is another initiative aimed at preventing and counteracting illegal immigration. 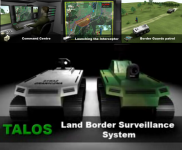 The complete TALOS system consists of three basic elements: Unmanned Ground Vehicles (UGV) and Unmanned Aerial Vehicles (UAV), used for border patrolling, sensor antennas mounted on mobile platforms, and the command and control centre, providing communication between all the elements on the site and the relevant Border Guard unit. The ground platforms will be the watching stations and the first reaction patrols, which will, upon identifying an ‘intruder’ will both inform the Control and Command Centre of their presence and intercept the intruder within minutes before the arrival of manned forces and inform them about their ‘illegal trespass’. TALOS architecture will be composed of the Unmanned Unit Command Centre (UUCC) and two Unmanned Ground Vehicles (UGVs). Unmanned Air Vehicle (UAV) and transportable Sensor Tower will be integrated into the system. The Unmanned Units Command Centre (UUCC) will be used to control and monitor the operation of the Unmanned Units. These will allow Border Guard officers to plan the surveillance mission and control the vehicles, and provide also an operational awareness. The commander will be presented with a visual map of the mission area, including position of the system elements, patrol routes and data from all the sensors, on different map layers. Commands and data flow between the command centre and system’s end units will be ensured by the communication network. Wireless network for TALOS system is going to be implemented. The main goal of its design is the ‘network reliability’, which is crucial to the whole system’s performance. Unmanned Ground Vehicles (UGVs) will be designed to constantly patrol the border section. The UGVs will be equipped with longrange detectors of moving vehicles and people, as well as sensors allowing the operator to recognize the detected objects. They are going to be controlled from the UUCC: either ‘driven’ by the operator, using a kind of ‘joystick’ and cameras carried by the vehicle or, in semi-autonomous mode of operation, being ordered to drive from one point in the mission area to another without ‘hands-on control’. The latter will be possible owing to state-of-the-art robotic navigation systems and advanced mechanisms of obstacle detection and avoiding. Two types of UGVs will be implemented: the Observer, used for patrolling the given section, and the Interceptor, used for engaging the intruder before arrival of the manned forces. An Unmanned Air Vehicle (UAV) will be responsible for the aerial surveillance and can be used as communication node in particular situations. Sensor Towers will be deployed in places requiring ceaseless 24/7 surveillance, or in places not accessible to the vehicles. The towers can be used both for sensor placement and as communication nodes. They will be transportable together with the whole system. To meet the requirements connected with the diversified nature of the Eastern EU land border, the system will be adaptable, transportable and cheap. These features are going to be achieved by using unmanned patrolling vehicles with a high level of autonomy and controlled from transportable centres, in place of the fixed infrastructure consisting of fences and static sensors. Semi-autonomous operation of the vehicles will allow to efficiently inspect large areas without engagement of large human resources. • Autonomous and Semiautonomous operation – autonomy of the vehicles patrolling the border is the key success factor of the concept behind the TALOS system. A surveillance system can be effective only when the operator is engaged and focused. This is connected with the effectiveness of the system, both of ‘human resources’ and economy. Autonomy of the Unmanned Ground Vehicles (UGVs) in TALOS system is a particular challenge. The vehicles are going to operate in a complex and variable environment. The UGVs will use precise terrain modelling, laser scanners and state of the art navigation modules. Programmed into the computers of the UGV’s and the Command & Control system will be sets of rules which are actually a translation of procedures used by the border guards in the daily routine and emergency operations. These rules will be modified from time to time, to adapt the system to new emerging ‘threats’, even day-by-day. • Mobility/transportability – The whole system will be easily transportable installed in standard containers (20 ft and / or 40 ft), transported on trailers for fast deployment in selected border zones (according to intelligence). The system will be moving in convoys to the designated location, where possible (ground access), but can be airlifted by helicopters to locations not accessible and is transportable by air in C-130 aircraft (or alike) to provide air deployment, within the country and between countries, all over Europe. The Command Centres, the UGVs and UAVs will be installed in containers and mounted on trailers, the Sensor Towers (transmitters), are also mounted on trailers. Once reaching the deployment area, the trailers are disconnected from the Trucks, located, fixed in place, etc., and system components are connected with all the necessary command cables, power supply cables, support equipment, etc. • Tactical Learning/Adaptation behaviour – During the development process, the system will be adapted to local operational requirements. TALOS uses adaptive artificial intelligence to respond to and implement tactical techniques, in the specific patrol scenario, area of operation, border topography, etc. • No need for fixed infrastructure or fences – TALOS system owing to its mobility and transportability do not require any fixed infrastructure. Sensors and cameras can be installed on UGVs. All UGVs and UAVs, including their supply and maintenance equipment will be stored in their own containers, as well as all crew equipment, dormitories, kitchen, toilets, supplies etc. After deployment, the containers will be camouflaged, and from there they will be launched to missions (automatically) and return to them after mission completion, for refuelling, servicing and maintenance. • Enables response to intrusion in minutes – system will respond to intrusion in the matter of minutes, not hours. • Usage of “green” energy – the energy in remote locations (where it is impossible to connect to standard power lines) will be coming from the natural sources e g. solar panels (sunny area), wind towers (windy area), water wheels (near to rivers). Moreover electrical generators will be used when none of these sources is available. These distributed energy sources in isolated areas are still susceptible to sabotage and according to intelligence this poses a problem for the ‘successful’ implementation of TALOS. The TALOS project will also establish the End User Advisory Board (EUAB), consisting of Border Guard representatives from EU member and candidate states, responsible for particular segments of the EU land border (Estonia, Greece, Poland, Romania and Turkey). EUAB task will be advising and supervision of the design and development of the system. TALOS is being developed by experts working for 14 institutions from 8 EU member states (Belgium, Estonia, Finland, France, Greece, Poland, Romania, Spain) as well as 1 EU candidate (Turkey) and 1 associated country (Israel Aerospace Industries) consisting of a consortium of industrial companies, research institutions, small and medium enterprises and a technical university. Project budget sums up to about 20 million Euros, 13 million of which has been granted by the European Commission. Let the gaze of the living sever the cables of control.